Hardly a recipe at all, this snack item is worth to share do to its popularity in the Philippines as well as its weirdness especially with non-Filipinos. This is one of the most sought after food items in the Philippines and it’s so rampant you can see them everywhere placed in water filled glass jars where street food are sold. Ask any Filipino or even show them this photo, I trust you in an instant they will drool over this simple combination of sweet and sour fruit mixed with the pungent and salty fermented shrimps. Really this is a no brainer but I want to share this to non-Filipinos who can give it a shot and let me know what your thoughts are. I love this snack…. one of my favourites as a child in the Phil. You’re absolutely right about drooling as soon as you look at the photo because that’s exactly what I did. YUM and double YUM! I love your blog by the way the recipes you post always brings back fond memories of my early childhood in the Philippines. I am glad you like my blog, thanks for visiting. I want! I am having a hard time keeping myself from drooling all over my keyboard. Lol, wipe it before someone sees it. Sarap talaga niyan! I love raw mangoes with salt/chili. Never tried this, should be good. When are you likely to run out of Filipino recipes? And why is Philippines spelt with ‘P’ and Filipino spelt with ‘F’??? Philippines during the old days was called “Las islas Felipenas” in honor of the (Philip II of Spain) then was simplified to “Las islas Filipinas”. Filipinas where Filipino word came from is then the Spanish form. The Americans then used the word “Philippines” during the American colonial rule, not sure why the Americans before never called Filipinos as Philippino. “Pilipino” was used after the Spanish rule dropping of “f” and replacing with “p”. In the 1987 Philippine Alphabet added the letters c, f, j, q, v, x and z. (Note we have 2 more extra letters ñ and ng). Then with the alphabet modernization both “Filipino” and “Pilipino” can be then used. So today either of them can be used. Sounds and looks delicious! Mangoes are one of my favorite types of fruit. Really? Mango with a fermented fish dish? 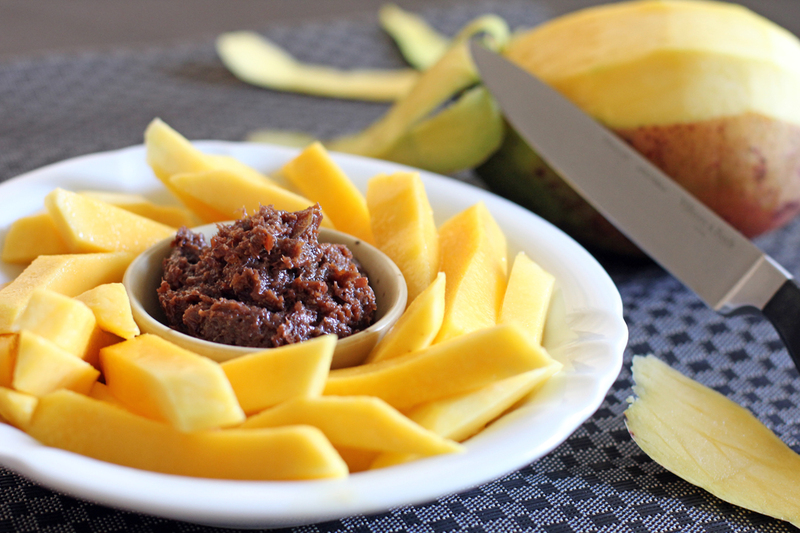 Was quite surprised to see what bagoong was. Not something I would think would be served as a dip with mango, but that’s why I love coming here to learn another cuisine. Thank you so much for introducing me to this appetizer! I only use the Barrio Fiesta ones in bottles but if you want to make your own then its a simple mixture of raw bagoong, a little bit of vinegar and soy sauce then sugar.